Opposition candidate Nana Akufo-Addo is poised to become Ghana’s president-elect having taken the lead after Wednesday’s election. There was anxiety in the country last night as citizens waited for the official announcement of the result. The provisional result showed that The New Patriotic Party (NPP) candidate, who twice lost the presidential election, had defeated President John Dramani Mahama. 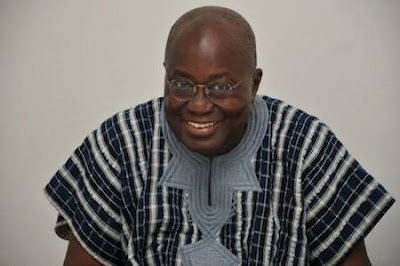 Akufo-Addo, 72, urged supporters of the party and Ghanaians to remain calm and focused and await the outcome. National Youth Organiser of the NPP Sammy Awuku said with the availability of declared pink sheets from 27,577 polling stations, the party could confidently place its presidential candidate at a comfortable lead of 53.79 per cent. Hundreds of supporters yesterday besieged Akufo-Addo’s Nima, Accra residence, asking him to address them on the outcome of the election which the Coalition of Domestic Election Observers (CODEO) scored high marks indicating that the arrangements put in place by the Electoral Commission (EC) for setup and opening of polls were adequate for most polling stations nationwide. Ghana has enjoyed two peaceful transitions of power through elections since 2000. But the 2012 election outcome was fiercely disputed and an economic slump caused by plunging commodity prices exposed Mahama’s government to a strong opposition challenge in Wednesday’s vote. “We have absolutely won the presidential race and we have a majority in parliament,” NPP policy adviser Boakye Agyarko told Reuters. A senior official for the ruling party, Samuel Ofosu-Ampofo, countered that Mahama was “comfortably ahead” and asked his supporters to remain calm. “The results are still trickling in and the call and declaration by the NPP is irresponsible and treasonable because it can throw this country into chaos,” he said. Electoral commission spokesman Eric Dzakpasu said it would need to verify some results in precincts where the number of votes cast appeared to exceed the number of registered voters, but it would start releasing returns later yesterday. An NPP spokesman said any further delay by the Commission in certifying results “gives suspicion that (it) is trying to overturn the clearly expressed will of the people. “We urge the commission to come out and announce the results and allay the anxiety of the nation that has voted for change,” spokesman Sammy Awuku told a news conference. “We call on the youth of our country to remain calm, we also say the electoral commission has a responsibility to … restore sanity to the process,” he said. But discontent has risen in the West African nation of 27 million people over the past four years as an economy once among Africa’s most dynamic has suffered from the drop in global prices paid for its gold, oil and cocoa exports.